I am a food fanatic, an unapologetic one. Don’t mistake me for just another person who claims to love food, no, because I take food very seriously. When I accompany my friends to restaurants, I make sure that I don’t go with Instagram addicts who would rather post 10 photos of a trendy meal which quickly gets cold than relishing a meal when it’s hot and fresh. In case you were wondering if I am foodie enough, the above should answer your questions. That being said, I enjoy all kinds of food; brunch, dinner, fast food, gourmet, cheese, no cheese, and the list goes on. However, like many people, my favorite has to be pizza, with a side of some cold frappuccino. I am a regular customer at Pizza Hut, Costa Coffee and other popular fast food joints. Which means, I get regularly bombarded with their promo codes and catchy discount deals. For a long while, I have enjoyed availing these offers and making the most of good deals to go about my weekly quota of take out food. Until something even better came along! 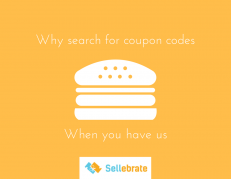 I stumbled upon Sellebrate.In while I was looking for gift cards for my friends during this festive season. While I had shopped for fashion stapled from this website already, I was still surprised to see how many food brands it packed. From my favorite fast food brands to some more family oriented restaurants, it showed me gift cards for most popular eateries I had heard of. To test the waters, I bought 1 gift card for a coffee shop and there I was next week, sipping coffee with a friend, using that gift card. It dawned on me that this just might be a win win for me. Not only was I going to save a lot, but this website was also giving me the option to sell my gift card back, exchange it for another and invite friends through its referral program. It was a winner, no matter how I looked at it.